Small Manufacturer Cloud Computing, it’s a Revolution! The small manufacturing sector is undergoing a rapid and profound transition – to small manufacturer cloud computing. Many small manufacturers are realizing productivity increases through cloud computing-based, mobile-enabled application solutions that heretofore only the largest manufacturers have utilized to manage their operations with great precision. Small manufacturers are increasingly turning to a panoply of emerging cloud computing services and resources including business software hosting, IaaS cloud computing (Infrastructure as a Service) and private virtual servers. The global demand for such cloud computing will grow nearly 19 percent this year to over $130 billion, reports market research firm Gartner and – more importantly – the growth velocity is expected to increase in North America, which is anticipated to garner nearly 60 percent of all new cloud computing budgets, from 2013 through 2016.
Business owners and managers at smaller U.S. manufacturing concerns are rapidly discovering that small manufacturer cloud computing, combined with mobile app technologies, provide easy cost-effective access to robust applications that facilitate a streamlining of operations and project management. In addition to increasingly employing newer generation manufacturer cloud computing software, companies now utilizing small manufacturer cloud computing almost instantly gain a deeper appreciation of how their facilities function optimally, how to anticipate and plan resources for new projects and how to more precisely manage inventory. The most obvious result of small manufacturer cloud computing is increased efficiency, greater customer satisfaction, decreased operational costs and, ultimately, higher profits. Manufacturer cloud computing solutions are infinitely more flexible than previous era 20th century on-location-only solutions. “Not only are on-location-only manufacturing software solutions more costly and complex to implement, but historically they were more inflexible, preventing businesses from viewing time-sensitive data in real-time. Today, however, as business moves even more rapidly, business owners can use a smartphone or tablet to remotely manage vendors, pricing, inventory and delivery projections,” notes Steve Leavitt writing at MBTMag.com. Equally exciting, mobile phone apps increasingly can sync with small manufacturer cloud computing-based software so that mission critical data is instantaneously available to other users on both their desktops and smart devices. There is no longer a requirement to wait for someone in data entry to reenter information that derived from the facility floor. It can be instant and automatic. “Implementing software to transform a business is less costly, less time-consuming and complex, finally making it accessible to hundreds of thousands of small businesses in the U.S alone,” adds Leavitt. For many if not most small manufacturers, the biggest challenge is managing their work-order pipeline. Sometimes their manufacturing floors are churning along, functioning into the evening to fulfill sales orders, while at other times the floor is quiet, even during daylight hours. This is where manufacturer clod computing really shines. Smaller manufacturers can now use an efficient, cost-optimal production asset to sail through a critical period of manufacturing rebirth. Manufacturing software, enabled by cloud computing and mobile access is now a well-tested formula for success for hundreds of thousands of small manufacturers across North America. This recipe – with balanced parts of efficiency and technology enables increasing innovation – and ensures that smaller manufacturers will be an engine of growth for our economy for many years to come. 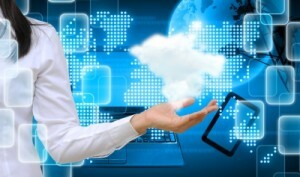 Small manufacturer cloud computing shifts the risk from manufacturer to service provider. 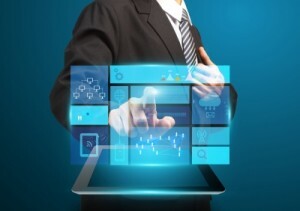 With a traditional manufacturing application, the manufacturer is accountable (and responsible and liable) for everything, including the hardware infrastructure, networking and data storage; as well as installation and patching the operating system), deploying and configuring the applications, and detecting/eradicating infections and malware. Small manufacturer cloud computing removes a sizeable percentage of the risk-exposure inherent in manufacturing by converting the infrastructure, cloud computing server platform and software to purchased (or subscription-based) services. At a significantly reduced risk, with SMB manufacturer cloud computing the value of cost-effective cloud-based IT and economics is transmuted to the benefit of the manufacturer. Small manufacturer Cloud “elasticity” makes virtually infinite processing power affordable. Cloud computing multi-tenancy is software architecture essential to cloud services cost-efficiency that can be passed on to cloud customers. It is the ability for a single instance of software, running in the cloud, to serve multiple clients on private cloud-based virtual servers. The end result is on-demand processing power, and data storage capacity elasticity replaces the ongoing project—and cost-prohibitive infrastructure—that would be required to design and scale a solution that starts with the first piece of equipment and eventually accommodates hundreds or thousands. A manufacturing cloud platform solution can be scaled and realized cost-effective, from a few machines or devices to thousands. Manufacturing cloud computing solutions pave the way to making improved business decisions with the support of non-manufacturing data assets. Leveraging cloud computing allows access to a tremendous resource of mission-relevant data that is external to traditional SMB manufacturing sources. One example is energy-related information. Depending on the geographic market where production is based, the options on how energy gets to the operating plant, along with per-unit costs and the impact of variable rates, all of which are all tied to data that begins beyond the manufacturing process. Remember us, Cloud9 Real Time. Our custom cloud solutions for business, nonprofits and professional practices garnered more industry awards last year than most of our competitors combined. Ready for a test drive? See for yourself what all the hubbub is about!